2nd ODI India vs Australia Adelaide: Eventually, it boiled down to seven runs required off six balls with former India captain MS Dhoni on strike to Jason Behrendorff. 2nd ODI India vs Australia Adelaide: Eventually, it boiled down to seven runs required off six balls with former India captain MS Dhoni on strike to pacer Jason Behrendorff in the second ODI between Australia and India in Adelaide. With series on the line, Dhoni slammed an unbeaten 55 off 54 balls to take India to a memorable six-wicket series-levelling victory. The highlight of India’s win was Dhoni’s match-winning hit off Behrendorff that sealed the deal for the men in blue in the last over. India captain Virat Kohli exactly knew that the game was in the pocket once the ball went over the ropes. 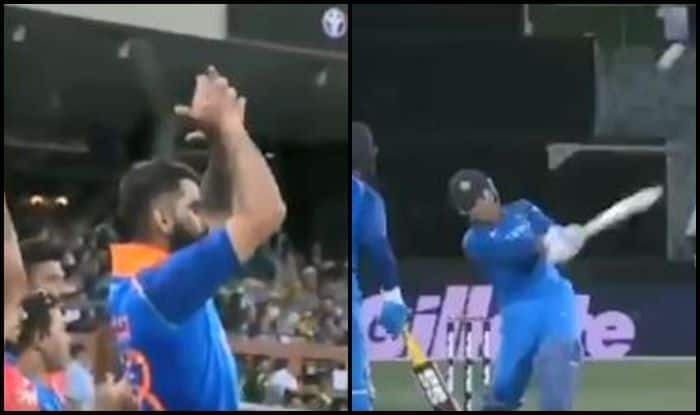 His stood up and applauded Dhoni which also showed the mutual respect they have for each other. India won the match by six wickets with four balls to spare. Meanwhile, Kohli scored 104 off 112 balls an innings that was laced with five fours and two sixes. He got a standing ovation as he walked off. Earlier, Australia scored 93 off the last ten overs as Shaun Marsh hit a brilliant 131 as Maxwell chipped in with a quickfire 48 off 37 balls. Bhuvneshwar Kumar was the pick of the bowlers as he scalped four wickets as Shami picked three.